New York: Random House, 1957. First edition. Fine/Near Fine. A Fine copy of the book in Near Fine dust jacket. Very slight scuffing to the lower corner of the rear board, otherwise Fine. Dust jacket spine a bit toned and with a tiny snag at the mid-spine, a few small nicks at the extremities. The jacket retains the critical $6.95 and 10/57 date code, essential for the first issue jacket. Rand's magnum opus, where she develops her objectivist theory and explores the question, "what if society's genius goes on strike?" Rand considered the book "not about the murder of man's body, but about the murder and rebirth of man's spirit." 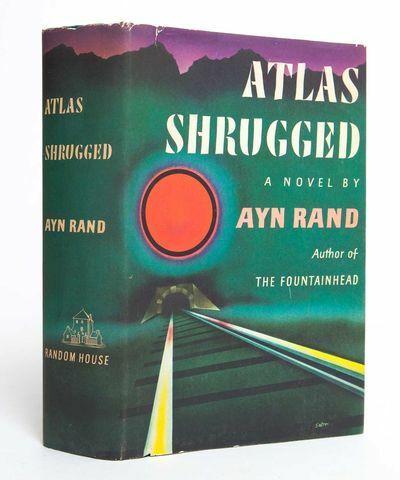 "Atlas Shrugged" has remained one of the most popular and influential books written in the twentieth century; one survey in 1991 finding it second only to the Bible in having the greatest impact upon its readers. The book would also place first on Modern Library Reader's Poll of the Top 100 novels of the 20th century. "...the reader will stay with this strange world, borne along by its story and eloquent flow of ideas." (Contemporary Newsweek Review). Fine in Near Fine dust jacket.